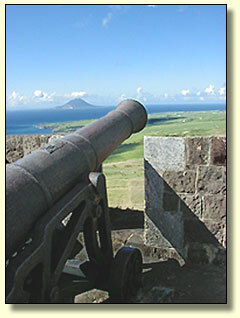 In February of 1782, a French fleet of nearly 50 ships appeared on the horizon off St. Kitt's and Nevis. Headed by Admiral Count François de Grasse, whose flagship was the exceptionally imposing 130-gun Ville de Paris, the fleet had been dispatched to force the British from the rich sugar colonies of St. Kitts & Nevis--and that meant dislodging them from Brimstone Hill, otherwise known as The Gibraltar of the West Indies. Situated almost 800 feet above sea level, this remarkable fortress is one of the most dramatic spots in the entire Caribbean, both historically and aesthetically. It commands astounding views of the Caribbean, including Nevis, Montserrat, Saba, St. Martin and St. Barts. Brimstone Hill sprawls over 38 acres, and its massive Fort George citadel is defended by seven-foot-thick walls of black volcanic stone--then better known as brimstone. In 1782 Brimstone Hill had been under nearly continuous construction (by slave labor) for almost nine decades. The 8,000-man French siege force, supported by de Grasse's substantial fleet, calmly set to its task. After a month of almost continuous bombardment, and despite staunch resistance by Brimstone's 1,000 British troops, the French succeeded finally in punching 40-foot holes in the citadel's thick walls. Knowing their situation finally to be without hope, the British surrendered. The French seige commander, the Marquis de Bouille, paid tribute to their heroic defense by allowing the British garrison to leave Brimstone Hill as an undefeated force, in full uniform and with standards held aloft. One year later, when the Treaty of Versailles returned St. Kitts to British rule, the same honor was accorded to the French garrison. Brimstone Hill was abandoned in 1851, and the fort suffered neglect and vandalism for the next century. In 1965, when the site became a national park, intensive restoration returned the imposing fortress perched atop the hill to its original grandeur. Tours of Brimstone Hill are conducted daily, and highlights include the hospital, ammunition stores, artillery officer's quarters, the Prince of Wales Bastion, and the Citadel of Fort George.